Does Phyrexian Revoker work on Archetypes? 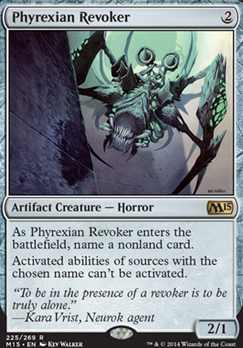 As Phyrexian Revoker enters the battlefield, name a nonland card. Settle the Wreckage is great with Aven Mindcensor . Emeria, The Sky Ruin free hatebear. Dust Bowl is good with a lot of basics. Isolated Watchtower too. Solemnity might be a strong tax depending on meta. Alms Collector white tax and card draw. Chancellor of the Annex personal favorite. 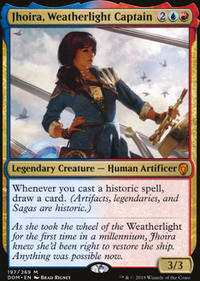 Last night I played against Circu's Hunger and Narset, Enlightened Wheeler. The first game I landed a turn two Blind Obedience . Narset got an explosive start, but ended up a Mana short of casting Narset before (Lavinia) Lavinia, Azorius Renegade hit the board and neutered his rocks. Otherwise game 1 was grindy. No one gaining the upper hand. 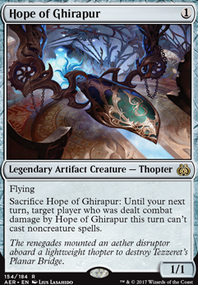 Circu's Dark Confidant chipped away at his life total, while digging for the win. Phyrexian Revoker naming Isochron Scepter turned off Circu's main wincon, and a combination of Aven Mindcensor beats and value extorting closed out the game. Game 2 opened with a turn 2 Ethersworn Canonist which slowed the game down a bit. Narset got Mana screwed, and sat on 2 lands for a majority of the game. Circu abused Ghoulcaller's Bell and fetchlands to try to set up Counterbalance triggers. I miscalculated, and cast Knowledge Pool only to be countered, kind of being kneecapped by my own Ethersworn Canonist . However a turn or two later, I dropped a Lion's Eye Diamond . (Which got Counterbalance 'd by a Drowned Catacomb ) followed by Auriok Salvagers . Yet again, Blind Obedience closed out the game the following turn. Thopter Foundry + Sword of the Meek + Time Sieve suffers from being a 3 piece combo and from card quality. Foundry can be worthwhile for instant speed blockers, but the other two are dead draws without the combo assembled. Sensei's Divining Top with either Grim Monolith + Power Artifact or Dramatic Reversal + Isochron Scepter is a much nicer package, as all the pieces have strong value independently. I would recommend Tainted Pact for running with Laboratory Maniac . It serves as an A + B combo for winning (+ draw 1 card ofc), and is safer for the purposes of your deck than Demonic Consultation , although you could easily run that for cheaper CMC comboing. Worth noting that Pact has synergy with Isochron, or can be used for getting the last combo piece for a Top combo. 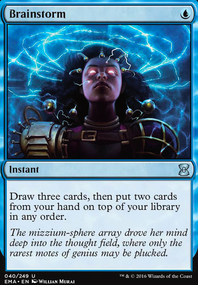 It seems as if assembling infinite mana + draw deck is your goal. 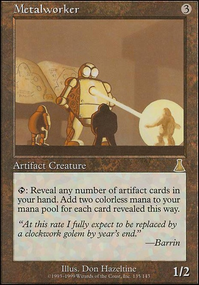 I would recommend slotting Copy Artifact + Winds of Rebuke as an alternate wincon to lab man wins. Combos with dramatic scepter (you copy the scepter, imprinting winds of rebuke, to mill everyone out and pass to them, causing draws into empty libraries for GG). Copy Artifact and Winds of Rebuke also both have very high card quality, both are playable independently. My last combo suggestion is for Praetor's Grasp . Especially with Sen having the potential to steal combo pieces, you have the potential to stop win cons as well as getting closer to your own. Praetor's Grasp will run as a functional tutor here, grabbing faster ramp or the combo pieces you need. 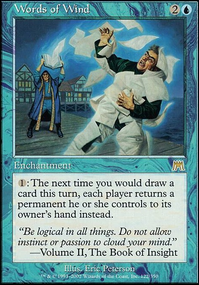 ad nauseum is a strong card, but you should consider the following. You are already pressuring your own life total with Dark Confidant as well as Phyrexian Arena , plus incidental damage from Mana Crypt as well as Ancient Tomb and the talismans. Your average cmc 2.33, meaning your Ad Naus will usually dig 10-20 cards, depending on damage and what you flip.. You also don't run any rituals, and have no way of reusing rocks outside of Dramatic Reversal . Supporting cards like Chain of Vapor or Hurkyl's Recall give extra mileage to Ad Nauseum as they let you re-ramp your own mana positive rocks after landing the Ad Naus, and Yawgmoth's Will is a monster in Ad Naus decks. You are also light on creatures and pack a medium sized removal package, so creatures can get free swings and reduce your Ad Nauseum that way too. You are running white, so you could decide to make ad nauseum + Angel's Grace a win-con as a possibility too. Right now Ad Nauseum looks more like expensive card draw in this deck than a strong win condition. As it stands, I firmly believe Necropotence is stronger in this current list. Your removal package can be modified to be faster and stronger. Council's Judgment has some nice perks, but it should be tertiary to both Swords to Plowshares as well as Path to Exile . Both of them are just far more efficient. 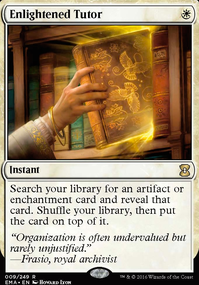 You also only have two answers to artifacts or enchantments on the board, Cyclonic Rift or Council's Judgment . 2-3 more bounce spells could help with board state by quite a bit, especially if you are able to stax them out of replaying their pieces. 1-2 pieces or artifact/enchantment removal will also go a long way to helping your board presence, especially since cEDH skews towards non-creature permanents. Humility + Night of Souls' Betrayal is a nice creature lock, but I would rather see wipes in both of those slots. Humility wrecks card advantage from your own commander, and Night is low card quality outside of combo. 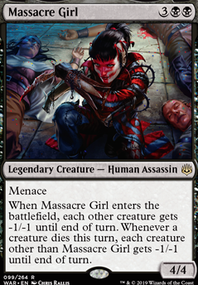 Elesh Norn, Grand Cenobite is the preferred -x/-x effect, as it kills many of the strongest hate bears in the format (+ lab man) and allows your own hatebears to win through beatdown. I wouldn't recommend Elesh in a bear-lite build, so I would propose two wipes or pieces or removal instead.